This page describes the methods used to process the personal data of users consulting the web site. This privacy statement has been drawn up in accordance with Art. 13 of Italian Legislative Decree No. 196/2003 (Privacy Code) protecting the personal data of users of the Antico Filò web site, accessible via Internet at: http://www.anticofilo.it. The privacy statement is also based on Recommendation No. 2/2001 that the European Personal Data Protection Authority, in a group meeting called by Art. 29 of Directive No. 95/46/EC, adopted on 17 May 2001 to establish the minimum requirements for gathering personal data on-line and, in particular, the methods, times and nature of the information the data controller must provide to users browsing web pages, regardless of the purpose of said browsing. When consulting this web site, data on identified or identifiable persons may be processed. The data “controller” is the company Antico Filò srl with registered office in Via Fossa 13, 31051 Follina, Treviso – Italia / Via Prà della Fiera 55, 31020 Falzè di Piave, Treviso – Italia. Data processed in relation to the web services of this web site will be processed in the above company offices only by authorized personnel, or by technicians performing occasional maintenance. No data from the web service will be communicated or circulated. The personal data provided by users sending requests for information (mailing lists, newsletters, answers to questions, etc.) will only be used to perform the service required, and will not be communicated to third parties. Surfing datas. The informatic system and the software procedure appointed for the running of this web site acquire during its running some personal datas which transmission is implied in the use of communication protocols of Internet. These are informations which are not collected to be linked to identified interested people but which could, because of its nature and through processing and association with datas owned by thir parties, allow to identify the users. In this class of datas recoupe IP adresses or demains of computers used by users which have access to our site, Uniform Resource Identifier adresses of required resources, request time, the method involved in processing the request to the server, the file dimension obtained as answer, the code with the answer state given by the server (well end, error, etc.) and other parameters regarding the operating system and the user informatic ambient. These datas are processed only to have anonimous statistic informations on the use of the site and to check the correct running. The datas could be used to verify responsability in case of possible violation of web site’s information. By user given datas, the optional, explicit and voluntary send of e-mails to the e-mail adresses specified in this site involves the registration of sender adress necessary for answering requests and also of other personal datas specified on the missive. No personal user data is acquired by the web site for this purpose. The session cookies used by this web site do not have recourse to other IT technologies potentially detrimental to users’ browsing privacy and do not allow the user’s personal data to be acquired. Except for browsing data as specified above, the user is free to provide their personal data in the company’s request forms. Refusing to provide said data may make it impossible to obtain what is required. The personal data is processed with automated and non-automated instruments, strictly for the purposes for which it was gathered. Specific security measures are taken to prevent data loss, illicit or improper use, and unauthorized access. The data collected may be used by the data controller, the administrators providing data processing services and for web site functions. The subjects the personal data refers to have the right at any time to obtain confirmation of the existence of the same data or not, and to be informed of the content and origin of the data, verify the accuracy or request the integration, revision or amendment of the same (article 7 of Italian Legislative Decree No. 196/2003). In accordance with the same article, the subject has the right to request the cancellation, the transformation into an anonymous form, or that any data processed illegally be blocked, and in any case also to object to the processing of the same on legitimate grounds. 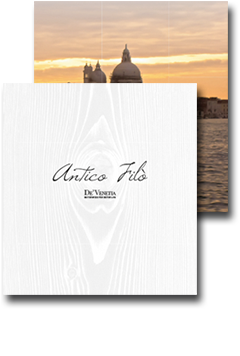 Any requests should be sent to Antico Filò srl. (C) 2014 Antico Filò srl. NOTICE: In accordance with Art. 1, Paragraph 1 of Italian Decree Law No. 72 – 22 March 2004, as amended by conversion bill No. 128 – 21 May 2004 the works in this web site have met the obligations deriving from copyright law and the related rights. The reproduction, public broadcasting, public circulation, hire and loan, public use and dissemination without the prior authorisation of the holder of the copyright, is forbidden. The sanctions provided for by art. 171, 171-bis, 171-ter, 174-bis and 174-ter of Italian Law 633/1941 will be applied in the case of violation. In accordance with art. 5 of Italian Copyright Law No. 633 – 22 April 1941, the texts of the official acts of the Italian State, other foreign States and public authorities are not protected by copyright. The specified copyright refers to the processing and the form in which the same texts are presented.